One aspect of my business that I’ve perhaps given more careful thought to than anything else, is how I gift wrap and package my jewellery for orders being sent out – it’s a thorny issue and there are several factors to address. By definition, it has to be a compromise between several considerations, from being tempting and attractive to look at, protective of the contents, cost proportional to the piece being wrapped (more on what that means momentarily) and not wasteful or overly extravagant to suit the sensibilities of the environmentally aware. To that end, I am happy that my gift wrap is either recyclable or can be used for something else. 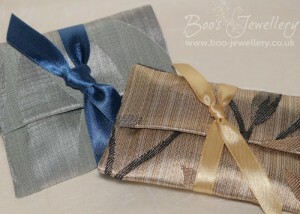 My fabric keepsake pouches, which have an overlap opening and are fully lined with a contrasting fabric. In respect of the costs of the gift wrap, I don’t just consider the cost of the wrapping materials themselves, but the knock-on implications that their proportions or weight might have on the outer postal packaging and the resultant postage costs. Here in the UK at present, our domestic postage is priced by both size and weight and the difference between something that is posted at 19mm deep and another parcel at 27mm deep is going to be £2.35 more in postage alone. It will also likely need a more expensive outer box and more packing material and tape to finish the parcel. So I feel that it’s important to keep gift wrapping both flat and light to keep prices as keen as possible. I have always included gift wrap and domestic P&P in my prices and have written previously about my rationale for this. Faux metallic leather and textured faux leather jewellery presentation pouches. So in deference to keeping my prices as low as I can for my customers, I have always worked towards fitting my orders into a slender ‘large envelope’ box to minimise postage costs. It has the added benefit that for many customers, it is also small enough to go through most letterboxes, so they’re not inconvenienced by a potential delay whilst they go and collect it from the sorting office, if it can’t be delivered because they’re out at work. And I like the idea of the protection of a box being on the outside. Another important consideration, especially pertinent to my own business, is to present jewellery in a manner that will allow the recipient to open and examine the piece and return it to its packaging without any detriment to its appearance. 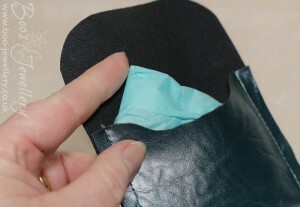 A little shaping cut into the pouch makes it a little more interesting than a square envelope. When pieces are being given as a gift, they are usually sent to the purchaser who will give the gift and understandably, they will want to have a peek at what they’ve bought before giving – I would certainly want to. But I don’t want them to feel reluctant to examine it because it features an extravagant bow they’d be nervous to remove and have to re-tie, or some other aspect they might find tricky. Just because I enjoy fiddling with gift wrap, doesn’t mean that others find it the same pleasure. As many of my customers are gentlemen, I like to keep the order as straightforward as possible and know that this aspect is appreciated. 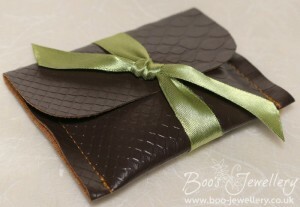 Textured faux leather jewellery pouch. The fabric has a soft knit backing, providing a further protective layer for the jewellery. So it has been my practice for some time to use two types of gift wrap, a paper envelope or a fabric keepsake pouch – both of which I make myself. I tie both of these up with a simple knot in ribbon, which minimises the bulk of the wrapping, but as a single loop around the parcel, allows the ribbon to be slipped off sideways, the gift to be examined and the ribbon loop returned. 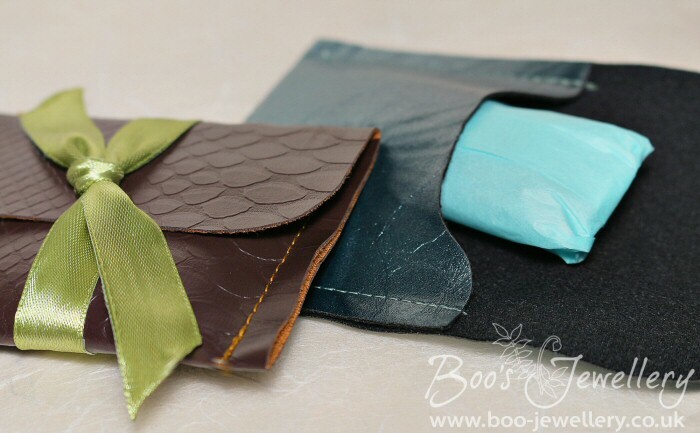 As a generalisation, I use the paper envelopes for small and /or less expensive items and the fabric pouches, because they take much longer to make, for more substantial pieces. I have used the same basic methods for my packaging for some time and am completely happy with how it performs in practice, with items travelling the globe safely for me and I’ve always had good feedback from customers. 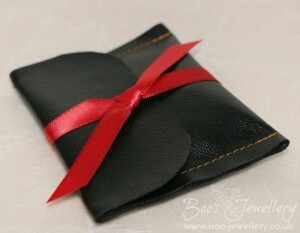 Black faux leather jewellery pouch with red double satin ribbon. Recently, I’ve had several orders, where a fabric pouch was the better solution, due to the shape of the piece or some other factor, but it wasn’t really justified by the price. So this set me to re-examine my current arrangements. Ideally, I wanted a soft packaging solution, but not one that took longer to make than the jewellery itself or cost more in materials. I could of course have just used some commercially made suedette gift bags, but where’s the fun in that! I’ve always prided myself on extending the hand crafted ethos to my gift wrap as well as the pieces, so I needed to design something to fit the bill. To minimise the manufacturing time, I needed to eliminate the amount of sewing and processes, it needed to be simple in construction and easily repeatable. My keepsake pouches are made in several stages, including cutting, several pressing stages, stitching and overlocking. The first thing I wanted to cut out, was the tiresome task of neatening the fabric edges, so something that didn’t fray would be ideal, so I turned my attention to faux suede or leather. 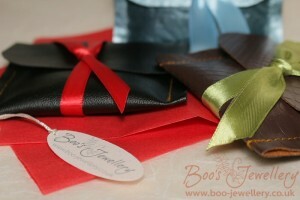 All jewellery has a label attached and is wrapped in 2 layers of tissue inside the pouch. I knew that I had a couple of faux leather cushion covers I’d picked up from a clearance bin for use for trimming, so set about to work some prototypes. I was also keen not to make something the same as anyone else, (although there’s little that’s truly original) so spent some time with on-line image searches, eliminating some of my ideas as they were already in use. As is often the case, you start with one design idea and as you work it, you fine tune the details. Some things don’t work as you expected and often you realise that you’ve over-complicated it as you gradually eliminate stages and pare down the workflow. By the time I’d worked a few examples, I was happy that I had a design that would tick all the appropriate boxes, in that it was inexpensive, quick to produce, hopefully attractive and with the softness and flexibility I wanted to allow the ribbon to be slipped off and back on again for inspection and to accommodate different thickness of jewellery. 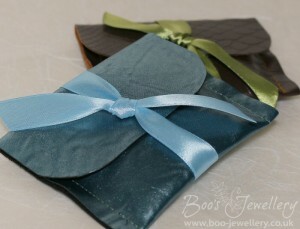 Jewellery pieces are wrapped in 2 layers of matching tissue paper inside each pouch. Each pouch only takes two lines of stitching and most of the effort is spent in cutting them accurately. As can be seen to the right, I decided that some shaping of the envelope gave a more pleasing result. A visit to a local fabric wholesaler who did a good range of faux leathers and I now had 4 further colours, to allow me a good variety of finishes. I’m very happy to add these additional pouches to my gift wrap options and feel that I’ve addressed a slight gap in my existing arrangements. In the process of designing these, I also settled on two further slightly more sophisticated designs to allow for slightly bulkier pieces and will produce a few more of these shortly. I’ve just started sending them out and hope that my customers will like them.